Interview: Peter Ross Range, Author Of '1924: The Year That Made Hitler' Adolf Hitler wrote his famous manifesto while serving time for an attempted coup that started in a German beer hall. Author Peter Ross Range says, "There was an obvious need to get his message out." 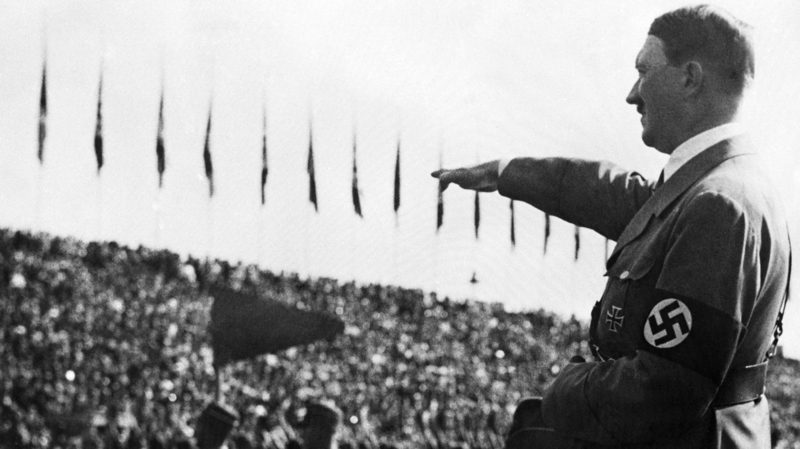 Adolf Hitler gives the Nazi salute in Nuremberg, Germany, in 1935. 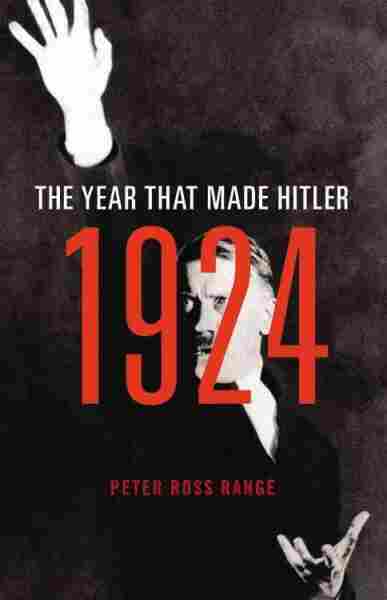 Author Peter Ross Range says that Hitler's time in prison in 1924 helped pave the way for his rise to power. Years before he led the Nazis in the genocide of 6 million European Jews, Adolf Hitler staged a coup and spent several months in prison. Though his attempt to overthrow the government was unsuccessful, his trial and subsequent time behind bars would be pivotal. Peter Ross Range, the author of 1924: The Year That Made Hitler, tells Fresh Air's Dave Davies that Hitler's public trial for the so-called "Beer Hall Putsch" was a confidence-builder that allowed him to sharpen the speaking skills that would help him win the German chancellorship nine years later. Though sentenced to five years in prison for the coup, Hitler wound up serving less than one year. During that time, Range says, "Hitler went into a period of reflection, and building his willpower and self-confidence, or self-belief, and he came out of it in many ways a new man." While incarcerated, Hitler also wrote Mein Kampf, a memoir and manifesto that outlines his political ideology. The reproduction of Mein Kampf had long been restricted by copyright laws, but on Jan. 1 those restrictions expired, and a new, 2,000-page annotated version is being published. "It's an attempt to break down Mein Kampf sentence by sentence, almost word by word, and explain it historically, philosophically; show the contradictions, show the lies and show the truths as well," Range says. He kidnaps those leaders. He takes them hostage on the spot, fires his pistol into the ceiling to get control of the room, has a platoon of storm troopers with him, including a machine gun team, takes those leaders into a side room and tells them they have the choice of joining him in his plot to march to Berlin and start a national revolution, or to die with him. ... He tells them that he is going to go back out into the beer hall and propose to the crowd what he's trying to get them to do, which is to become part of his new government for Germany. He goes back out, he makes a speech, which according to an eyewitness, "Turned the crowd inside-out like a glove." This was the best proof we've ever had really of Hitler's extraordinary speaking and persuasive powers in a mass situation. And indeed, the people by the end of a very short speech were cheering and stomping and approving of his new plan. So after he has convinced the crowd that this national revolution is a great and good thing, he takes the three leaders back into the hall, everybody has an emotional moment of handshakes and deep looks in the eyes, and the whole event ends with the whole crowd singing "Deutschland, Deutschland über alles," the so-called song of Germany. Hitler seems to have won. As [Hitler] and 2,000 of his men marched through the center of Munich, they got a lot of cheers and support from the crowd, but as they emerged on the other side of downtown at the Odeon Square, they came up against a company of riflemen from the Bavarian state police who went into a kneeling and firing position and indeed fired on them. The putsch came to a very violent end. Hitler came within 24 inches, probably, of being shot dead. Sixteen people ... were killed as well as four of the Bavarian state police troops. That ended the putsch and Hitler went down with a very badly dislocated shoulder, but he escaped and was caught two days later at a friend's villa outside Munich. [At the trial,] he tells his life story, for one thing, and he gives his political worldview, for another thing. And he opens right up in the first paragraph by saying, "I am an absolute, committed anti-Semite." He is baldfaced and clear about that and says that that's what he became during his years as a down-and-out worker in Vienna before World War I. But he's basically preaching his version of the salvation of Germany. He sees Germany as going to hell in a handbasket and suffering under the yoke of the Versailles Treaty, the French occupation and the very bad leadership [of the] ... governments in Berlin. ... The Hitler name was suddenly on the front pages all over the country and all sorts of people now knew about him. Initially he went into a deep, deep depression. He went into a hunger strike; he basically tried to commit suicide by starvation. ... It lasts eight or nine days until he's finally talked out of it. He was in pretty bad shape and they were about to give him forced feeding. ... That didn't happen because he ... gave up the hunger strike, but that was the starting point of this extraordinary comeback. He had to write a book. He had to talk. This was a guy who was obsessed with his own sense of mission, his belief that he was a man of destiny who had to save Germany from itself. And since he didn't have beer hall podiums from which to speak and declaim and share with the world the urgently needed gospel that he had within him, he set it down in writing. He was able to get his hands on a small Remington portable typewriter, a brand new one, given to him by a rich friend, and started writing this book. Some people say he also did it for money, which I think is probably true, but in Hitler's case, there was an obvious need to get his message out, and that's why he wrote the book. What if Hitler had been struck by the bullet that hit the man next to him [during the putsch]? Or if his bodyguard had not protected him during the putsch? What if he had killed himself in the hunger strike, or in his suicide attempt just when he was being captured? What if he had gotten a serious trial with a serious sentence? And then finally, what if he had been deported [to Austria] as, in fact, the law stipulated?